Sometimes a horror movie will be released that you cannot wait to dig into. You count down the days to release, watch the trailer as many times as possible, and plan to be at the movie theater the second they open the doors on opening day. Then something happens..the movie isn’t playing near you. Hell, the entire STATE that you live in isn’t playing the film. Talk about a let down. 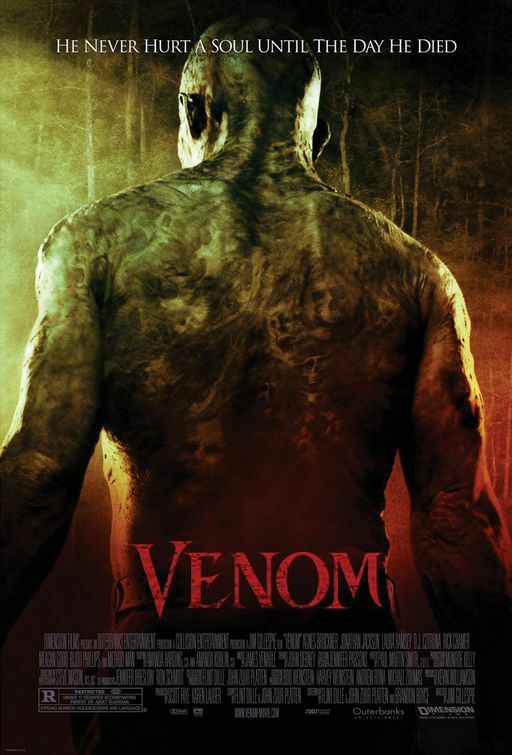 Such for me was the case behind the Dimension film “Venom.” Produced under the working title “Backwater,” the film was a little bit of a 90’s slasher reunion. The film was to be directed by Jim Gillespie (“I Know What You Did Last Summer”) and written/produced by Kevin Williamson (“I Know What You Did Last Summer”, “Scream”). After countless rewrites of the script, Williamson took his name off the project as writer but kept his producing title. Going into the summer of 2005, the movie was shaping up to be a big hit for the studio. What went wrong? “Venom” opens with a Creole woman digging up a small briefcase from the ground in the pouring rain. Because, as we all know, everyone in Louisiana it is always raining. She then proceeds to get in her car and drive down the Louisiana road. Meanwhile at a local burger joint, high school senior, Eden (Agnes Bruckner), is working with her best friends, Rachel (Laura Ramsey) and CeCe (Meagan Good) while the rest of her friends hang around the place. Ricky (Pawel Szajda) is aimlessly flirting with Patty (Davetta Sherwood) and Tammy (Bijou Phillips) by giving them alcohol. Eric (Jonathan Jackson) and Sean (D.J. Cotrona) talk about important matters until Ray Sawyer (Rick Cramer) pulls up in his tow truck. These names couldn’t get more white trash if they tried. After work, Eden begins to bike home alone, but Eric catches up to her to talk to her about going to college in New York. While they were talking, Ray drives up and asks if Eden’s alright. He begins to leave when another car, carrying the Creole woman who turns out to be CeCe’s grandmother. Her car falls halfway off the bridge. Ray gets out of the truck and helps Eric to save the woman. Ray saves her, but the woman begs Ray to get the suitcase. As Ray reaches in the car to get it, the car capsized into the water. The briefcase begins to move and finally opens releasing several awful CGI snakes. As the car sinks into the bayou the CGI snakes attack Ray, leaving him possessed as he goes after the clueless teens. Those damn CGI snakes I tell you, they are the cause of half the horror on Syfy! What the movie turns into is a routine slasher movie in which Ray must kill the teens in order to unleash an ancient evil unto the world. The death seems are pretty ho hum as most of the gore is kept offscreen and the characters are about as annoying as you would expect. The one exception being the sweet and surprisingly likable Megan Good as the granddaughter. She delivers her overwritten lines with gusto and she is the right combination of genuine and intelligent. Too bad about those other characters as Good is one of the first of the crew to die. We are left with the bitchy and grossly unlikable Bruckner to carry the day. Why do filmmakers do this? Didn’t anyone learn anything from the death of Rachel in the horribly conceived “Halloween 5”? It took me seven years for me to watch this as Dimension dumped this into only a few hundred theaters thanks to the tragedy that was Hurricane Katrina. As if the victims involved would have carried about a dumb voodoo movie. Who cares? By the time it was released on DVD, I sure didn’t. I definitely didn’t after watching this 90 minute mess of a movie. Williamson should have taken his name off this disaster all together. As for Dimension, I’m guessing this was a case of too many cooks in the kitchen. An idea that started out strong but everyone had to get their little grimy claws on the script. Note to Dimension, stick with releasing your horror movies and let the horror filmmakers create their own movie. Also…another note…I wanna see the original cut of Cursed. Thank you.